The name of this organization shall be “Thames Valley Trail Association Incorporated”. 1) Develop and maintain a hiking trail in the Thames Valley with subsidiary trails where possible. favourable attitude toward trails and hiking, and an appreciation of our natural environment. 1) The Association shall have two classes of members, known as (a) association and (b) honorary members. a. Association members: This class of membership shall be open to the general public and shall include existing life members. property and shall last as long as the trail passes on said member’s land. 2) Fee structure: Annual dues shall be set by the board as set out in the Association By-Laws. 1) There will be at least one scheduled general meeting of the membership during the fiscal year. 2) Members will be notified at least thirty days prior to the meeting of the time, place and purpose of the said meeting. 4) General meetings will require a quorum of 10% of the membership. 6) Meetings shall be conducted according to Robert’s Rules of Order. members to distribute, collect and count the ballots and report the vote. 1) The Association shall be financed by membership fees, donations, and any other means consistent with its objectives. in Ontario and whose aims are in agreement with one or more of TVTA’s objectives. members elected by the board. A minimum of two signatures (preferably a President and Treasurer combination) is required. must be retained and supplied to the Treasurer for inclusion in the financial records. 1) Board members shall be elected at the annual general meeting in each fiscal Year. 2) The board shall consist of at least ten directors, to include the offices of President, Secretary and Treasurer. to be published in the newsletter. Other nominations for candidacy must be made in writing by a nominator and seconder. prior to the vote being taken. beyond their sixth year to complete the second year of the office held in the sixth year. 5) Vacancies on the board may be filled by appointment of the board until the next annual general meeting. 6) The board may form or dissolve committees on the advice of the membership or on its own initiative. or by proxy. The decision to suspend must be made by at least 75% of the board members. 8) The board shall transact business on behalf of the Association. No director of the association shall be liable for the acts, receipts, neglects or defaults of any other director, or for joining in any receipts or other acts of conformity, or for any loss or expense happening to the Association through the insufficiency or deficiency of title to any property acquired by order of the board for or on behalf of the Association, or for the insufficiency or deficiency of any security in or upon which any of the moneys of the Association shall be invested or for any loss or damage arising from the bankruptcy, insolvency or tortious act of any person with whom any of the moneys, securities or effects of the Association shall be deposited, or for any loss, damage or misfortune whatever which shall happen in the execution in the duties of the office or in relation thereto unless the same shall happen through that person’s own dishonesty. made, done or permitted by the director in or about the execution of the duties of the office. majority of the membership present at any general meeting of the Association membership at which a quorum is met. Any motion to change the articles must be submitted in writing to the board prior to the August board meeting. This allows notification of the proposed changes to the general membership at least thirty days prior to the annual general meeting (via the Fall Trekker newsletter). Modifications to only these proposed article changes can be approved at the general meeting by an affirmative vote of at least two-thirds of those members in attendance. In this Constitution and By-Laws of the Thames Valley Trail Association Inc. hereafter passed, unless the context otherwise requires word importing the singular number or the feminine gender shall include the plural number or the masculine gender, as in the case may be, and vice-versa. In any situation not specifically herein provided for, the procedure pertaining to a Corporation without share capital in Ontario shall apply insofar as they can be made to apply. capacity to advise and counsel the board. groups etc. of other organizations and will be expected to report to the board. date. No refunds will be issued. statements will be checked and approved by the board prior to being presented at said meeting. 6) A quorum will be set at 50% plus one of the board for board meetings. expected they will provide a report to the board. the two other signing officers, and this must be reported to the board at the next meeting. submitted to ensure the maintenance of TVTA’s charitable and corporate status. 12) Criteria will be set in the Guide Book for acquiring end-to-end badges. 14) TVTA hike leaders must abide by the Constitution, By Laws and set policies of the association. Maintenance and the Director of Trail Development of the club and to be passed on to succeeding directors. Provision of on site general training (excluding the use of power equipment) of volunteers at a trail maintenance or trail development outing is the responsibility of the leader of that particular session so as to ensure appropriate task assignments. Members who verify that they are proficient in the use of power tools by virtue of their profession or extensive experience may participate in trail maintenance and building at the discretion of the leader responsible for the work session. When a trained operator is using power equipment such as a chainsaw or brush cutter, they must be accompanied by an assistant, preferably one who is trained. Volunteers who participate in group trail maintenance or development will sign a Waiver of Liability. Any volunteer who is younger than 18 must have written permission from a parent or guardian in order to participate. All trail building is to be done with the landowner’s prior knowledge and approval. This is the responsibility of the leader of the activity or an agreed-upon delegate. provide the current inventory information. Each maintenance worker shall ensure that their TVTA tools remain in good repair at the club’s expense. Certification List: A reasonably current written record of those volunteers certified in the use of power equipment for trail maintenance or development session is to be available on our club website for use by trail maintenance leaders. Periodic updates of this list are to be sent to the Trail Maintenance Director by those responsible for organizing and verifying a club certification course. The information will then be forwarded to our club webmaster by the current Trail Maintenance Director for posting. on to their successor in a timely fashion. Our club uses the widely-recognized form of directional trail guide - the white blaze for a main trail and blue blaze for a side trail. Signs at our trailheads will indicate in positive language the permitted activities only, the assumption being that all other activities are prohibited. Signs may also be posted to convey clear guidelines for trail use and behavior such as the Trail Users Code. Signs will also state that the trail is unsupervised and is for “use at your own risk.” The Trail Development Director is responsible for determining sign locations and for their initial installation. The ongoing repair or replacement of trail signs is the responsibility of the Trail Maintenance Director. Our club undertakes regular inspections and audits of the trail for hazards and signage and then documents these inspections and any resulting actions. Forms that document these activities are kept forever by the Trail Maintenance Director and are passed over from the former to the new director when a change in personnel occurs. Forms will be stored in the club computer for use by those performing trail audits or maintenance/development. As of January 2012, all hike leaders must be certified by Hike Ontario through the recognized Hike Leader Certification Course. Some of our leaders may be recognized for their experience e.g. Scout Leaders and therefore may not be required to become Hike Ontario certified. The decision to recognize this experience rests with the club board. Following a hike leader certification course, it will be the responsibility of the course leader to provide the Activities Director with a list of those successfully certified. The Activities Director will then send this information to the Club Webmaster to be added to the already-existing, password-protected website list of leaders for use by appropriate personnel. $250) to help defray expenses for an Advanced/Specialized First Aid course for an annual maximum of 2 people. At the February board meeting each calendar year, the Board will appoint a First Aid Co-ordinator to document the First Aid training of club members. This Co-ordinator will provide to the webmaster an up to date list of those in the club who are certified in First Aid as their courses are completed during the year. This list will be posted on our website in a password-protected site available to appropriate personnel. Power Equipment training - Only those volunteers who are certified in the use of power equipment or who are approved by the leader of a trail maintenance/development session are allowed to use such equipment. Safety equipment is supplied by our club and must be worn at all times when power equipment is being used. The “Waiver of Liability and Assumption of Risk” form – see Appendix A – will be verbally explained by the hike leader or Trail Maintenance/Building leader before being signed. This will ensure knowledge of conditions by participants and what rights they may be waiving by signing the form. The form will be read and signed by all participants before the hike or activity begins. The signed forms will be retained in storage by the Activities Director forever. Maintenance) for future reference. Reports should be kept forever. Significant incidents shall be reported in a timely manner to both our club insurer and to Hike Ontario. The current version of the Incident/Accident report is available for downloading at our club website. Hard copies of the form are available at Grosvenor Lodge. be followed by confirming correspondence to the landowner. A copy of our insurance certificate will be provided to the landowner upon request. The Director of Trail Development is responsible for maintaining these agreements. is also part of our due diligence. Other collaborative measures which may benefit trail clubs should include having trails clearly marked in municipal official plans and park plans with the permitted uses specified e.g. “pedestrian only” or “ mixed use”. Special trail club events may require additional liaising efforts with landowners. The provision of monthly reports from the Treasurer to members of the TVTA board will ensure that we have adequate budgetary provision for building and replacing unsafe trail infrastructure and signage, hike leader training, and insurance coverage. The Thames Valley Trail Association carries both general and directors’ liability insurance. The club maintains complete and accurate records in an appropriate manner. The current Hike Ontario Insurance Broker is Pearson Dunn Insurance Inc. represented by Rosemary Dunn at 1-800-461-5087. 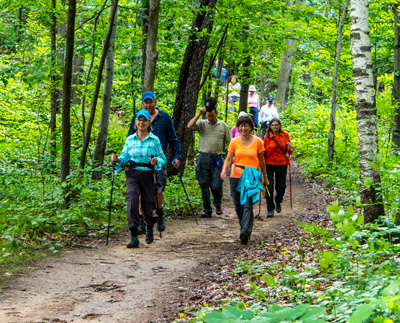 All club or trail association hikes will be published in our trekker or on our website. To be covered by the Hike Ontario insurer, all unadvertised hikes must be communicated to and acknowledged by Hike Ontario in writing. In the event of a lawsuit, pass all legal correspondence – without comment or answer – to the insurer immediately.  pass all records in possession to new directors when elected. Keep records of trail development activities forever, pass all records in possession to new directors when elected. Inform blazer of the need for blazes on any new trail sections. Maintain records of all landowner agreements. Pass these records to your successor in a timely manner. Maintain Waiver of Liability forms forever. Ensure that Incident Reports received are dealt with in a timely manner and copies kept forever. The following courses are offered through Hike Ontario (hikeontario.com) and sponsored by TVTA. The Safe Hiker Program is also a prerequisite for the Certified Hike Leader course unless exempted by demonstrated previous experience. NOTE: TVTA requires that once the training is completed and you want to lead hikes for our club you must become a paid TVTA member. TVTA will reimburse the fee for this course when you have planned, posted and led three hikes. To be eligible to take this course and, thereby become a Wilderness Day Hike Leader, you must have completed the Certified Hike Leader course, have lead a minimum of five day hikes in remote/wilderness areas, and present a letter of reference and/or recommendation from a recognized authority, (i.e. a certified Hike Leader, a hiking club, etc. ), and have current Standard First Aid and CPR certificates (Wilderness First Aid Recommended). TVTA will reimburse the fee for this course when you have planned, posted and led one Wilderness hike. Definition: Wilderness Day Hikes are hikes that are more than 2 hours from road access. hold current Standard First Aid and CPR certificate (Wilderness First Aid recommended). The club will reimburse a board-approved sum to a maximum of 4 people each year to help defray expenses from their Basic First Aid training. We will also reimburse a board-approved sum (suggested maximum of $250) to help defray expenses for an Advanced/Specialized First Aid course for an annual maximum of 2 people. Preference is given to active hike leaders. Contact the First Aid Co-ordinator, Joyce Orchard to have your name put on a list. The TVTA Board is responsible for advertising hikes in only two places. 1. All hikes are advertised in the Trekker newsletter. The exception to this is when a hike leader decides to lead a hike after the Trekker has been published. The hike leader is asked to contact the Trekker Editor so that the information can be put on the website on the appropriate page. a) Members must log in to see the hikes offered to members only and guests. This information is not available to the general public. website can access this information. 3. Hike leaders have the option of advertising on the Meet Up site. Hikes are posted only by the Meet Up Coordinator on the Meet Up site with the permission of the hike leader in question, and only after the hike leader has approved the content and wording of the posting. The hike leader will set an attendance cap. The hike leader is only identified in the posting by first name. No personal information is available to the Meet Up members or to the public at large. The Meet Up coordinator is to report to the Activities Director. 6. All TVTA hikes are Members and Guests only unless advertised as OPEN. This policy may be revisited in the future to change our policy if the TVTA board members and hike leaders deem it necessary. 2. Rambler Hikes are posted on the private “log in”site. They are posted 7 days prior to the hike. The calendar will display these hikes with a starting time, hike details and a meeting location map (if available). On January 1, 2004 a new Federal Law regulating the use of personal information by business organizations came into effect. This law affects the way personal information is collected and used within an organization. A basic principle underlying the Personal Information Protection and Electronic Documents Act (PIPEA) is knowledgeable consent by our members regarding the collection, use or disclosure of personal information. Ten privacy principles that govern information handling practices have been developed that outline the steps needed to comply with PIPEDA. We are required to maintain and protect the information we have obtained from our members from unauthorized access. The collected information is to remain confidential and not be disclosed to unrelated parties without permission or where allowed by law or regulation. This information is collected for the purpose of servicing your membership needs. Personal Information means any information that can identify an individual and may include but not limited to, Social Insurance number, date of birth, name and address and phone number, income, occupation. Provision of personal information is your choice. However your decision to withhold details may limit the types of services we are able to provide. o Determine what your interests are. Your consent is required for us to collect, use or disclose the personal information except where allowed by law. Consent can be verbal, written, express (ie an application form) or implied (by not withdrawing consent to a certain use when there is a opportunity to withdraw it). Consent can be withdrawn at any time subject to legal and contractual concerns and with reasonable notice. Information that is collected will be limited to that needed to communicate with our members on upcoming events. To solicit their opinions and support on future events and in providing ongoing support to members. Any release of personal information to outside third parties must be authorized by you. Outside parties interested in any of the personal information we have collected must obtain your written consent and present us with your authorization before the information can be released. Information to which we are legally required to disclose will be released to the appropriate authorities. There are some situations where we are permitted to disclose personal information. An example would be where is suspicion of illegal activities or in medical emergencies. Personal information that has been collected will be retained for the period of time that it is required. Once the need for the collected information has ended the information will be securely destroyed. Only that information that is needed will be collected and retained. If, for any reason, the collected information is required for a different purpose, a new consent request will be needed from our members before that information can be used. A member has the right to have corrected or amended any information that is found to be incomplete and or inaccurate. The Thames Valley Trail Association has the necessary physical, electronic or procedural measures in place to safeguard personal information against loss, theft, unauthorized disclosure, misuse or change. As a member, you have the right to review the information on file with the Thames Valley Trail Association, how the information is used by the Association, its accuracy and completeness. You may request that any information that is found to be incomplete be amended. People may direct any questions or enquiries about our privacy policies or practices by contacting our designated Chief Privacy Officer, who is responsible for responding to your questions or complaints in a timely and efficient manner.